Edwards' Hairstreak in Massachusetts is closely tied to its host plant, scrub oak (Quercus ilicifolia), and thus is found mainly in dry, rocky or sandy ‘barrens’ areas. Named in the 19th century in honor of William Henry Edwards, it was not clearly distinguished by Thaddeus Harris, who apparently confused it with Banded Hairstreak. Scudder had it right, though, and this species appears to have been fairly common in Massachusetts, especially around Boston, where it had been collected by “everyone,” (including Harris in 1827; see his Index and specimen). Scudder also cites specimens from Andover in the northeast; Amherst, Deerfield, Leverett, Mt. Toby, and Springfield (“abundant”) in the Connecticut River valley; and Cape Cod and Nantucket (where it was “extremely abundant”) (Scudder 1889: 895). In the Harvard Museum of Comparative Zoology today there are some seventeen specimens from Nantucket which were collected by Scudder. F. H. Sprague specimens show Edwards' Hairstreak present before 1900 in Belchertown (1895), Deerfield (1885), and Montague (1885) in the valley, as well as Wollaston (1883) near Boston (MCZ, BU). At the turn-of-the-century Edwards' Hairstreak was also found in Waltham (1896; C. Bullard, MCZ), Newton (MCZ), and Wellesley (1899, Dentons, MCZ); these towns at that time must have had more dry open habitat. More notably, it was also found in Framingham (1906, C. A. Frost, BU). On Cape Cod Scudder's report is confirmed by many specimens from Harwich (1920, 1924) and Yarmouth (1924) taken by C. J. Paine Jr. and John B. Paine Jr. (MCZ, C. J. Paine Collection). In the 1930s and 1940s, Edwards' Hairstreak was also found in Stoughton (1930, Hagelstein, MCZ), Milton (1940, H. Clench, BU) and Canton (1941, Yale), and many, many specimens were taken in Fall River, for example in 1934 and 1935, D. J. Lennox (UNH); 1936, 1937 and 1948, W. P. Rogers (Yale); and 1933, 1934 and 1935, likely W. P. Rogers (AMNH). From Martha's Vineyard some fourteen or more F. M. Jones specimens are at Yale; one is dated 7/22/1931. Twelve West Tisbury specimens from 1947 (no collector) are at the McGuire Center. Edwards' Hairstreak was "sometimes excessively abundant" on the Vineyard in the 1930's and 1940's "especially in the Plains area, alighting on leaves and projecting sprays of scrub oak" and "clustered on Asclepias flowers" (Jones and Kimball 1943). This island remains a stronghold for Edwards' Hairstreak today (see below). By contrast, on Nantucket, despite Scudder's report of abundance, there are no other early records. "No record of its capture was noted by Johnson during his collecting trips from 1926-29, and none have been taken during the years 1936-41," perhaps owing to loss of habitat through brush fires (Jones and Kimball 1943). There are no specimens in the Maria Mitchell Museum, and there are only one or two sight reports in recent years. North of Boston, the significant collection of C. V. Blackburn, now dispersed to various museums, documents the presence of Edwards' Hairstreak in the rocky uplands of what is now Middlesex Fells in Stoneham. There are three C. V. Blackburn Stoneham specimens at the California Academy of Sciences (1932, 1939); three at the McGuire Center in Florida (1931, 32, 33); two at AMNH (1932, 1933); one at the Smithsonian (1930), and seven at Yale (1933). Throughout the 1960’s and 1970s, Edwards Hairstreak was reported by collectors in eastern Massachusetts to be common within its particular habitat. Charles G. Oliver found it “very common in scrub oak areas in Concord” in 1965 (two specimens at Yale).. James P. Holmes found it "common" on the 22 July 1967 in the heath area in the center of Cape Ann. A small colony was found in Westford on 7/17/1972 by Edward Peters (LSSS 1965-73). William D. Winter took specimens in Westwood (1968), Dover (1973), Holliston and Millis (1974) (MCZ), and Larry Gall found seven specimens on Beaver Brook Reservation in Belmont on 28 July 1976 (Yale). Robert Robbins took it in Woburn in 1976 (Smithsonian). Malcolm Douglas collected it in Ashland in 1963 (McGuire), Robert Godefroi found it in Middlesex Fells (1987), Wellesley (1985), and Wilmington (1988) (McGuire). But in western Massachusetts, there is only one report in these years: Deane Bowers "took many fresh specimens" on 8 July 1976 in Montague, presumably on Montague plains (Lep. Soc. Seas. Sum. and Corresp., 1965-76). There are no Connecticut River valley specimens between the 1880s and 1976 (Montague), and there are no Berkshire County specimens. Loss of scrub oak habitat was pervasive across the state after 1900, particularly in the lower Connecticut River valley, and may have led to overall declines (Table 2). The principal, if not the only host plant in Massachusetts is scrub oak (Q. ilicifolia). In states to the west, scarlet oak (Q. coccinea), black oak (Q. velutina), and white oak (Q. alba) are used, and may be used here (Scott 1986; NatureServe 2010). Many Edwards' Hairstreak larvae from scrub oak were found by Prof. D. Wagner on June 4, 2013, at Great Blue Hill in Canton, MA (click here for a photo, showing ant tending). The Connecticut Atlas found eggs or larvae in the wild only on scrub oak. Eggs are laid on or near the buds of the host plant, and the larvae begin feeding during the day on the oak buds and young leaves. The more mature larvae feed nocturnally and rest at the base of the food plant within a byre of litter built by ants. The ants stay near the larvae and feed on their honeydew. The ants tending Edwards' larvae at Great Blue Hill in 2013 were identified by Prof. Dave Wagner as Lasius alienus, a different species from the Formica integra which has been reported from other locations. The mature butterfly is never found very far from its host plant, and thus needs dry, scrub oak habitat. Its fortunes are dependent on the extent of this habitat. But it also seems to need nearby floral nectar sources, since it is often found on many midsummer flowers, including New Jersey tea, meadowsweet, white sweet clover, wild indigo, and various milkweeds and dogbanes (MAS Atlas). Edwards' Hairstreak adults may also feed on the honeydew secreted by pip galls on scrub oak acorn buds; at Great Blue Hill, many adults have been seen on acorn buds, probably feeding (for example, http://brucedegraaf.zenfolio.com/p209444686/e6655d8cb). Presence of a requisite species of ant is a critical feature of the habitat; without the ant, seemingly suitable habitat will remain unoccupied (NatureServe 2010, D. Schweitzer). Judging from Scudder's descriptions, Edwards’ Hairstreak would seem to have declined in abundance since the 19th century, most particularly in the Connecticut River valley but perhaps to some extent in eastern Massachusetts as well. In both areas, there has been habitat loss as pitch pine/scrub oak barrens were developed (Table 2). Both MBC (2000-2007) and Atlas (1986-90) records rank this species on the high end of “Uncommon” (Table 5). It is less abundant than Banded Hairstreak (which is ranked Uncommon-to-Common), but somewhat more abundant than Striped Hairstreak, Coral Hairstreak, or Acadian Hairstreak. It is our second most common hairstreak, after Banded. The number of MBC sightings per total trip reports shows no overall major decline in Edwards' Hairstreak between 1992 and 2009 (Chart 19). However, list-length analysis of MBC records 1992-2010 found a small 16% decline, which was not statistically significant (Breed et al. 2012). A decline in sightings 2005-2009, from a peak in 2004, is evident in both Chart 19 and in an analysis of MBC sightings per number of trips reporting that species. Chart 19 suggests a pattern of population ups and downs every 4-5 years, with peaks in 1992, 1998 and 2004. The decline in Edwards’ Hairstreaks 2005 – 2009 can also be seen using a similar measure published in Massachusetts Butterflies: In 2007 the average number of Edwards’ Hairstreaks per report of that species was still high enough to be up 43% compared to the average for all preceding years back to 1994. However, by 2008 the average was down 21%, and by 2009 down 27% from the average for preceding years. The maximum number reported in any one report was also flat or down in 2007, 2008, and 2009 relative to prior years (Nielsen, Season Summary, MB 2008-2010, Nos. 30, 32, 34). MBC records confirm the near-absence of Edwards’ Hairstreak west of the Connecticut River, which had been reported by the 1986-90 MAS Atlas. In Berkshire County, the Southern Berkshire NABA Count reported 2 in 2004, and 2 in 2005. Edwards' Hairstreak is found in the Connecticut River valley and central Massachusetts, but the numbers reported have been meagre. Scudder's historical reports from “the valley” suggest much greater abundance. Springfield has two reports of singles, in 1999 and 2008. Edwards' has been reported consistently in small numbers from East Longmeadow in 1992, 1999, 2000, 2001, 2002, 2004, 2005, 2006, 2007, and 2008. There is one report of a single from Florence, in Northampton, in 1998. There are no MBC records from Montague Plains, which in former years was known as a site for this species (for example Bowers' 1976 Lep. Soc. report). Longtime butterfly observer M. Fairbrother reports that since he found one there during the Atlas period (7/14/1987), none have been found since, despite yearly checking on the NABA Count. During the 1980’s and 1990’s this area slowly developed more closed-canopy forest, reducing habitat for species such as Edwards’ Hairstreak and Frosted Elfin. Logging and controlled burns are now being used by Massachusetts Fish and Wildlife to restore open habitat, and if that is successful, Edwards’ may return (M. Fairbrother, pers. com. 7-14-2010). Edwards’ has been found in some central Massachusetts towns such as Worcester and West Boylston, but more frequently in many towns to the immediate west and southwest of Boston, including Belmont Habitat Sanctuary (max. 6 on 7/6/2002 A. McGinnis); Burlington Mary Cummings Park (max. 10 on 7/4/2007 E. Nielsen et al. ); Concord (NABA Count, max. 8 on 7/12/2008 D. Walton et al. ); Foxboro (reports from NABA Counts most years through the 1990’s, max. 32 on 7/7/1996 T. Dodd and C. Asselin); Grafton; Hopedale; Lexington Great Meadows (max. 7 on 7/8/1997 M. Pelikan); Mansfield; Medford Middlesex Fells (max. 17 on 7/2/1994 B. Malcolm); Randolph; Sharon; Sherborn power line( max. 5 on 7/4/2004 E. Nielsen); Uxbridge and vic. (NABA Blackstone Valley). Edwards’ Hairstreak is common at two particularly important locations near Boston: Horn Pond Mountain in Woburn and Great Blue Hill in Canton. Among many MBC reports each year, the high count for Horn Pond Mountain was 36 on 7/1/2004, M. Rines and R. LaFontaine, and for Great Blue Hill was 25 on 7/3/2005 and 7/1/2004, T. Murray and E. Nielsen et al. At Blue Hill, Edwards' Hairstreak caterpillars were "abundant" in June 2013, according to Prof. David Wagner. These two areas are high-elevation sanctuaries surrounded by dense peri-urban development. Edwards’ Hairstreak apparently declined on Nantucket after Scudder’s enthusiastic reports from the 1870’s and 1880’s. Jones and Kimball (1943) say that it was "unrecorded" between 1926 and 1941, despite searches. Scrub oak is once again abundant on Nantucket, however, and the species should be findable (LoPresti 2011). The Atlas recorded Edwards’ at a Nantucket Audubon property (7/14/1988 W. Eighmey), and MBC has one record from Tuckernuck (7/29/2005, M. Pelikan). Martha’s Vineyard remains an important state stronghold for this species. Jones and Kimball (1943) had noted its abundance there, and though the Atlas found it at only one location, MBC records show many reports from Edgartown, Oak Bluffs, Chilmark, Tisbury and West Tisbury. It has been reported in high numbers nearly every year on the Martha’s Vineyard NABA Count: 1999, 2000, 2001, and 2004 through 2013. The high count was 138 on 7/16/2005. The Vineyard checklist describes it as “common to abundant” (Pelikan 2002). On Cape Cod, MBC records contain many reports from Falmouth, especially from Crane WMA (maximum 58, Falmouth NABA Count 7/16/2005, A. Robb et al.). Other reports are from Wellfleet (4 on 7/21/2003, M. Faherty), Truro (2, 7/13/2013, T. Hansen), and Harwich, and a report of 213 on 7/16/2011 at the Massachusetts Military Reservation in Sandwich (E. Nielsen and P. Trimble). Mello and Hansen (2004) say that Edwards’ can be found at the Mashpee barrens and the outer cliffs of Truro and Wellfleet. Like Manuel Correllus State Forest on Martha’s Vineyard, Myles Standish State forest in Plymouth and Carver has been an important stronghold for this butterfly. The largest numbers reported recently were 1000 seen along 1 1/2 miles of Alden Road, Myles Standish State Forest on July 8, 1988 (Atlas; Lep Soc Season Summaries 1988), and 100+ on 6/27/2010 M. Arey, which were “nectaring by the dozens upon patches of common and blunt-leaved milkweed” (masslep). North of Boston, north of Horn Pond Mountain and Middlesex Fells, there have not been many recent reports. During the 1985-90 Atlas period Edwards’ was found in Andover and North Andover by S. Goldstein, in Lynn by C. Arbogast, and in Gloucester and Rockport by C. Leahy. In MBC records, there are several reports from Gloucester in the mid-1990s by D. Savich and C. Tibbits. The northernmost recent report is Newburyport Little River Nature Trail, 8/6/2009 B. Zaremba, photographed. Edward’s Hairstreak appears to be approaching its northern range limit in Massachusetts now, because it is quite rare in states to our north (see below). There are no MBC reports from towns along the northern Massachusetts border, and the Atlas had only one northern border report, from Ashby. In central Massaachusetts, there are no MBC reports north of Princeton, the locus of the Northern Worcester NABA Count. There are no reports from the Northern Berkshire NABA Counts, and no recent reports from Montague Plains in Franklin County. 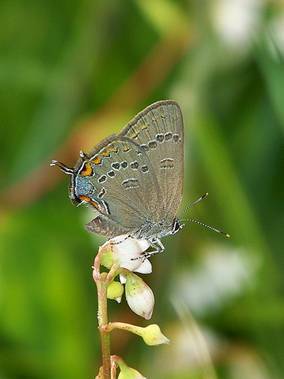 Like our other Satyrium hairstreaks, Edwards’ Hairstreak has a single flight, mainly in July. It is most frequently reported during the first two weeks in July, but the main flight period extends from mid-June through the end of July, with a few reports stretching on into August ( http://www.naba.org/chapters/nabambc/flight-dates-chart.asp). Earliest Sightings: In the 23 year period 1991-2013, the seven earliest "first sighting" dates in MBC records are 6/11/2010 Canton Great Blue Hill, S. Jaffe [and also many mid-June 2010 reports from other locations]; 6/20/2013 Woburn HPM, G. Kessler; 6/20/2011 East Longmeadow, K. Parker; 6/21/2004 Woburn HPM, T. Murray; 6/21/1998 Northampton Florence, T. Gagnon; 6/22/2012 Woburn HPM, H. Hoople; and 6/22/1991 West Boylston, T. Dodd. The Atlas early date had been 6/21/1990 Manomet, D. Lang. Flight Advancement: Scudder wrote 100 years ago that Edwards' Hairstreak appears "sometimes as early as the 22d of June," drawing on observations from New York, for which the latitude is unclear (1899: 896). Many Massachusetts sightings have been on or slightly earlier than this date. A 2012 study at Boston University using MBC and Atlas data found that Edwards' Hairstreak had significantly advanced its flight period over the years 1986-2009 (p= 0.0055) (Polgar, Primack et al. 2013). As with all hairstreaks and elfins examined, emergence was quite responsive to average temperatures in the two months preceding flight time. Subsequent analyses using 1986-2012 data found Edwards' Hairstreak had advanced its flight about 9-10 days over this later period (Williams et al., 2014). In this study, all ten elfins and hairstreaks examined had advanced flight dates somewhat, with elfins advancing more than hairstreaks. Latest Sightings: In the 23 years between 1991 and 2013, the five latest MBC "last sighting" dates are 8/23/1997 Tisbury M. Pelikan; 8/15/1992 Worcester T. Dodd; and 8/9/2002, 2003, and 2004. The Atlas late date was 10 August 1987, Lynn, C. Arbogast. Scudder wrote that this “exceedingly lively insect” remained on the wing throughout August, and even sometimes into September. On Nantucket [apparently] he had “taken a pretty fresh female as late as August 28” (1899:896), which is later than any recent records. Loss of its special upland scrub oak habitat to succession and human development is the chief threat facing Edwards’ Hairstreak. 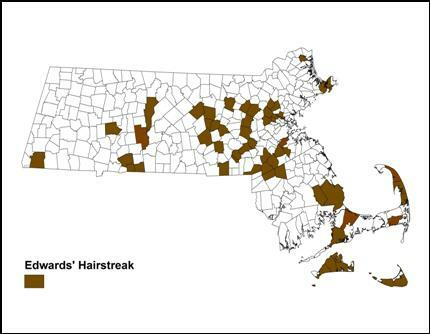 In Massachusetts it seems to warrant its state conservation rank of S4, or “apparently secure” (NatureServe 2010), but in many surrounding states the status of Edwards’ Hairstreak is of great concern. In Maine, Edwards’ is found in only a few southern townships, and it is state-listed as Endangered (Maine Butterfly Survey 2010). In Vermont it is known from only 1 Atlas bloc, and is a species of conservation concern (Vermont Butterfly Survey 2010). In New Hampshire it is ranked S3 or “vulnerable” (NatureServe 2010). This hairstreak has a more northerly range than does Banded or Striped, and it is not known how it will respond to climate warming.